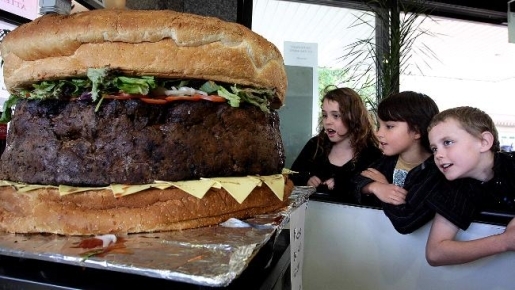 It’s a one-off item, not destined to be a part of the permanent menu at Ambrosia On The Spot, but restaurant owner Joe El-Ajouz is incredibly proud of his latest creation: a 210-pound hamburger that has been declared a world record food item! As you can see by the expression on the faces of the children in the front row, 210 pounds (81kg) is a whole lot of burger meat. As with any giant food item, this burger took a lot of time, energy, and raw materials. The burger took a staggering 12 hours to cook all the way through. There were 178.5 pounds of raw meat combined with 120 eggs for the patty, which was garnished with 16 tomatoes, 120 cheese slices, over 4 pounds (2kg) of lettuce, and over a pound of barbecue sauce. The bun alone weighs 46 pounds (21kg)! I’ve seen some big burgers, but this one takes the meat-based cake! Amazingly enough, after the burger went on display, it was later cut up so people could sample it! Yes, people ended up eating at least part of that thing. I’ll eat just about anything, but I don’t think I’d want to sample that after it’d been sitting out all day.